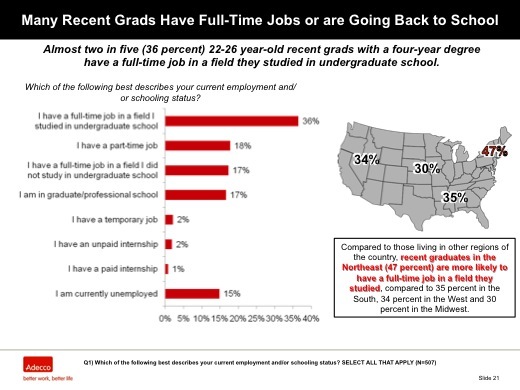 Adecco Group North America’s 2012 Graduation Survey captures a snapshot of the latest generation of 22-26 year-old recent graduates with a four-year degree who are entering today’s workforce. Dubbed this year as Generation “I,” these grads have a secure understanding of who they are and what they want – and they aren’t willing to compromise. This survey uncovers why for today’s graduates it seems to be “all about them,” why they are so keen to jump around – jobs, where their live - and what’s really behind their drive and desire for frequent change. 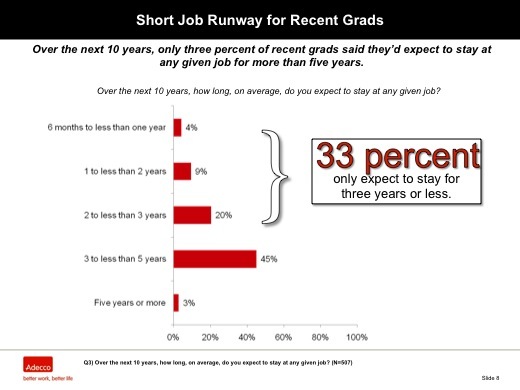 Not a very long job runway for recent grads – over the next 10 years, only three percent of recent grads said they’d expect to stay at any given job for more than five years. A third (33 percent) only expect to stay for three years or less. 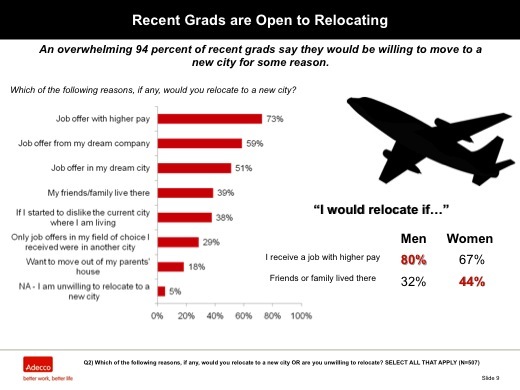 Like their expectations of relatively frequent job hopping, recent grads are equally open to relocating. An overwhelming 94 percent say they would be willing to move to a new city for some reason. The top reasons for relocation include job offers with higher pay (73 percent), a job offer from their dream company (59 percent) or a job offer in their dream city (51 percent). Notably, young men are more willing than young woman to relocate – if the price is right. Eighty percent of young male graduates say they would be willing to relocate to a new city if they received a job offer with higher pay compared to only 67 percent of young women. On the flipside, 44 percent of women would relocate to a new city if their friends or family lived there, compared to only 32 percent of young men. 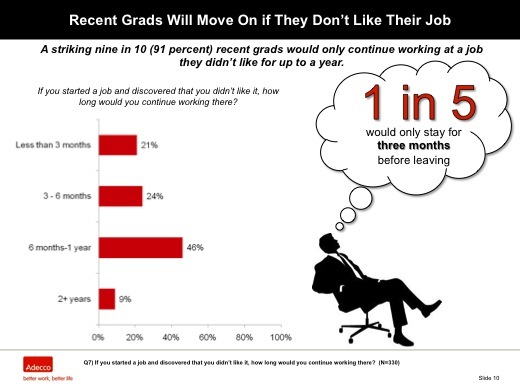 Another reason for college graduates to move on quickly – they don’t like their job. Nine in 10 (91 percent) recent grads would only continue working at a job they didn’t like for up to a year. In fact, just one-fifth (21 percent) say they would only stay for three months before leaving. 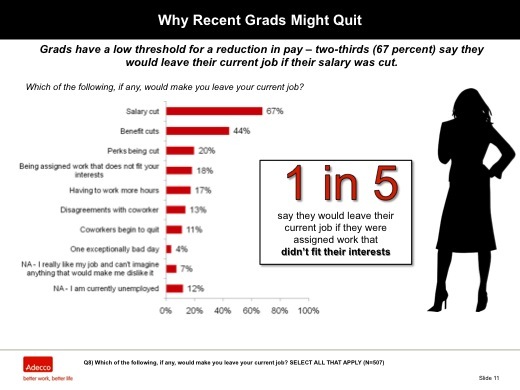 There’s also little patience for salary cuts as two-thirds (67 percent) of recent grads say they would leave their current job if their salary was cut. In a further nod to Generation “I”’s preference to pursue what they want most, nearly a fifth (18 percent) say they would leave their current job if they were assigned work that didn’t fit their interests. 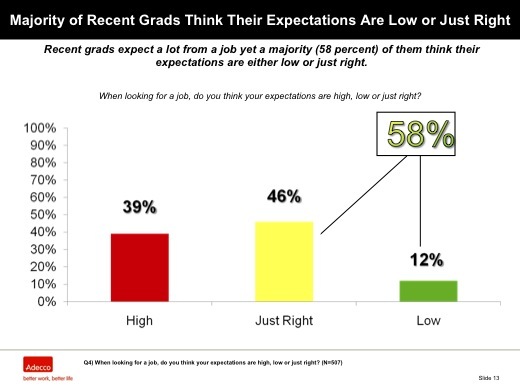 Recent grads expect a lot from a job yet a majority (58 percent) think their expectations are either low or just right. Generation “I” wants what they want and they may not be willing to settle for less. When given a list of 15 job search-related factors (e.g., good company culture, prestige in the industry, benefits, etc. 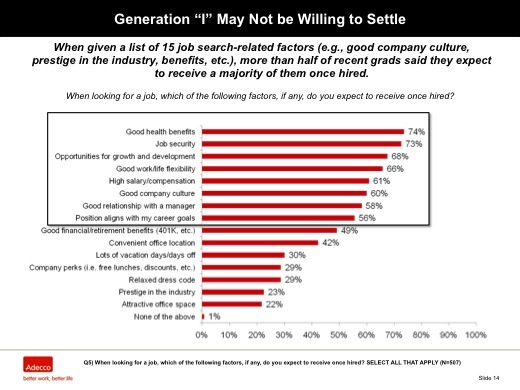 ), more than half of recent grads said they expect to receive a majority of them once hired. Good health benefits (74 percent), job security (73 percent) and opportunities for growth and development (68 percent) top the list of expectations. 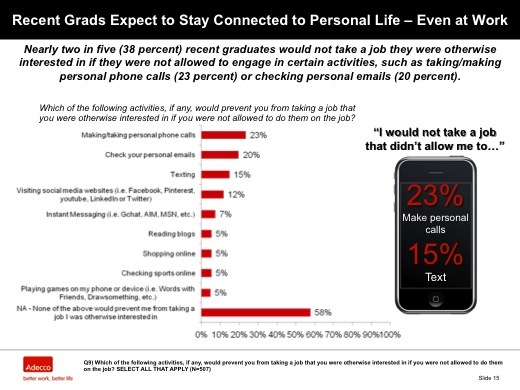 Grads also expect to have the opportunity to stay connected to their personal network while at work. Nearly two in five (38 percent) recent grads would not take a job they were otherwise interested in if they were not allowed to engage in certain activities, such as taking/making personal phone calls (23 percent) or checking personal emails (20 percent). Generation “I” is also very competitively focused on their peers. Seventy percent of recent graduates feel some kind of pressure to keep up with their peers when it comes to their career. In fact, 41 percent say they feel pressured when peers make more money than they do and 38 percent say they feel pressure when their peers are at a higher level in their career. Online social media sites also heavily contribute to peer pressure with one-fifth (20 percent) of recent grads saying that they feel pressure when they see their peers update their status on social media sites about their career. Peer pressure is highest in the Northeast region of the country – where half (51 percent) of all recent grads say they feel more pressure when their peers make more money than they do, compared to only 39 percent feeling this way in the South, 38 percent feeling this way in the West and 37 percent feeling this way in the Midwest. Nearly a third (30 percent) of recent graduates report that their parents are in some way involved in their job search process – in some cases, very involved. 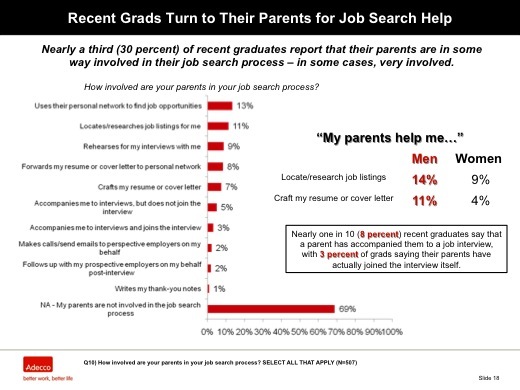 More than one in 10 (13 percent) recent graduates report that their parents use their personal network to find job opportunities for them and 11 percent say that their parents help them locate and/or research job listings for them. Interestingly, young male grads appear more likely to get help from their parents compared to young female grads. Fourteen percent of young men report that their parents help them locate/research job listings compared to only 9 percent of young women. Similarly, 11 percent of young men report their parents help them craft their resume or cover letter, compared to only four percent of young women. But it’s not just cover letter and resume help that parents lend – they are also accompanying some grads to their interviews! Nearly one in 10 (8 percent) recent graduates say that a parent has accompanied them to a job interview, with 3 percent of grads saying their parents have actually joined the interview itself. Parents are also helping out beyond the job search. 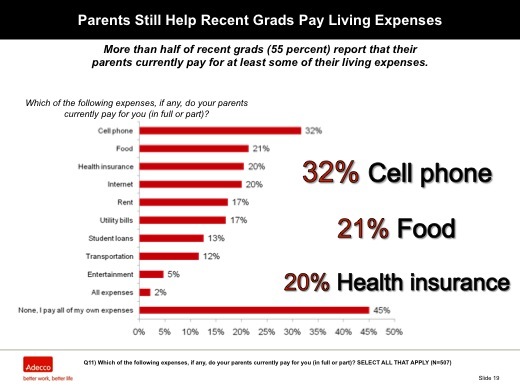 More than half of recent grads (55 percent) report that their parents currently pay for at least some of their living expenses – the most popular being cell phone bill payments (32 percent). Other expenses grads get covered by their parents include food (21 percent), internet (20 percent) and health insurance (20 percent). Almost two in five (36 percent) 22-26 year-old recent grads with a four-year degree have a full-time job in a field they studied in undergraduate school. An equal number of recent graduates either have a full-time job in a field they didn’t study in undergraduate school (17 percent), have a part-time job (18 percent) or are in graduate school (17 percent). Compared to those living in other regions of the country, recent graduates in the Northeast (47 percent) are more likely to have a full-time job in a field they studied, compared to 35 percent in the South, 34 percent in the West and 30 percent in the Midwest. Main Findings: Generation "I": Who and Where Are They"